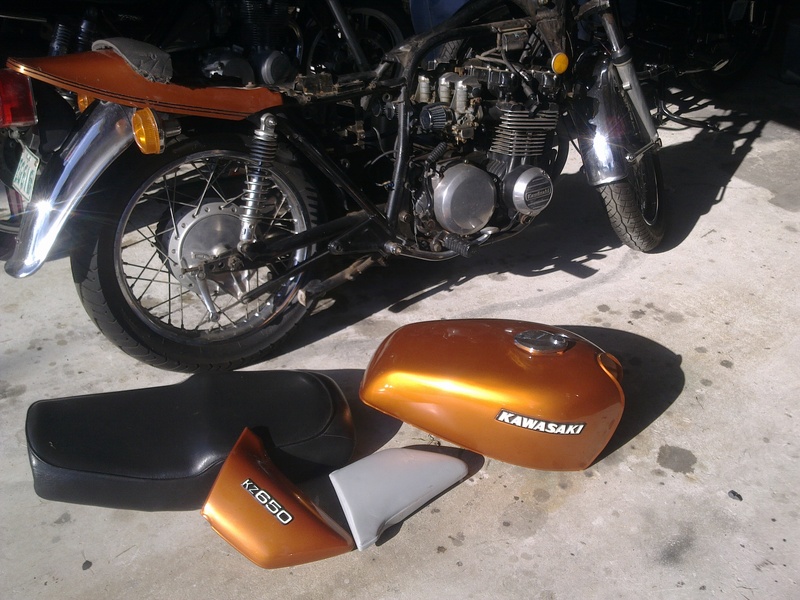 A few years ago I purchased a 1977 z650 from a lady in Toowoomba, west of Brisbane, it had been neglected and was a partial/mainly non-runner. It needed extensive cosmetic, electrical and suspension work. 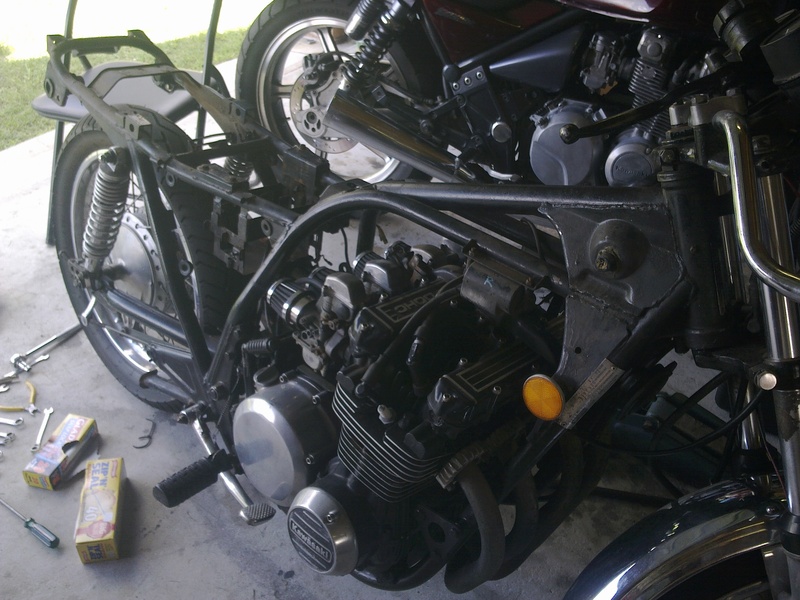 The engine was unknown at time of purchase but started after much effort and does need some work as the compression is down and the clutch has the typical slipping/ snatching issue that all worn out z650’s have when the clutch basket rubbers wear out. Rather than a full restore, Heather (my partner at the time) and I decided on doing a refresh of the bike and work out a long term rebuild plan. Since completion, the rebuild has featured in the VJMC magazine club magazine as well as my restoration book. Now a few years down the track “Heather” as I call the 650, needs a bit of minor work. 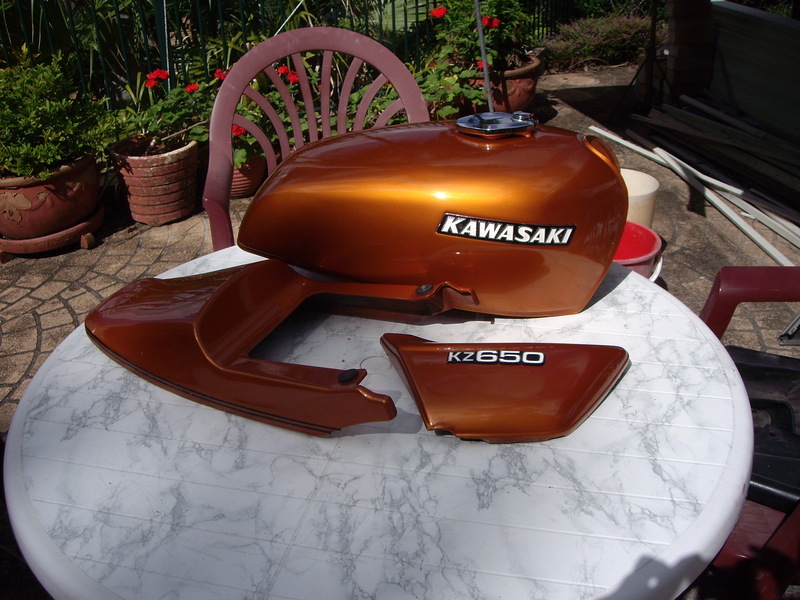 I’ve decided to get everything finished so the bike is reliable and usable as well as looking as original as possible (ignoring the fact it has a Copper /Gold Paint Job). I’ve finally found time to do the starter clutch, in the process I pulled my clutch hub from the spare engine (that’s the one going into the z650 CR project) as all the 650’s needs new clutch rubbers fitted. Dave Sloan who owns the Fuel Injected z650 featured in Practical Motorcycle Mechanics also has one to do, so we are going to spend a garage day drilling out the hubs and fitting new rubbers (I see a tutorial coming here). Other than that, I need a battery for it and get some replacement parts, such as a headlight rim and a missing engine bolt. The starter clutch has finally failed! – I suspect the springs as it was slipping and spinning and then grabbing prior to complete failure to grab. I will order some springs from the local kawasaki dealer and start removing the bits to get the the clutch, the springs are almost the same as the GPz900R springs so failing supply issues, I can get them out of the UK no problem. Tutorial on strip down and replacement coming up! There is a lot more yet to be done to complete the bike. The rims, fender and forks need rechroming, the paint work needs to be completely redone and new badges need to be fitted. there is engine work to do and new bearings to fit in the wheels as well as respoking with stainless spokes and professional cleaning of the alloy on the hubs and engine. 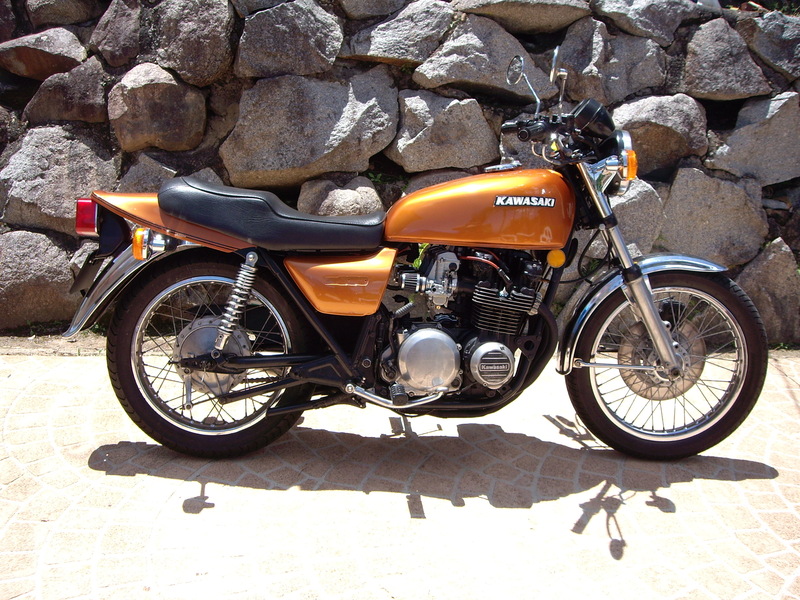 But despite this the bike looks OK after a good polish so apart from the paint it is mainly in original shape. 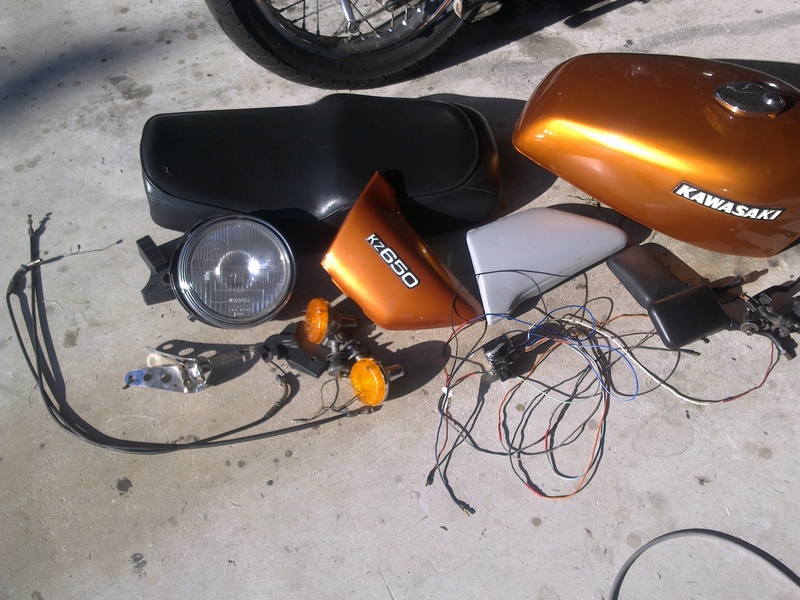 Normally I strongly urge people to just remove and replace one item from the bike and return the refinished item as quickly as possible, the result of this is to keep the bike in a complete, assembled state. 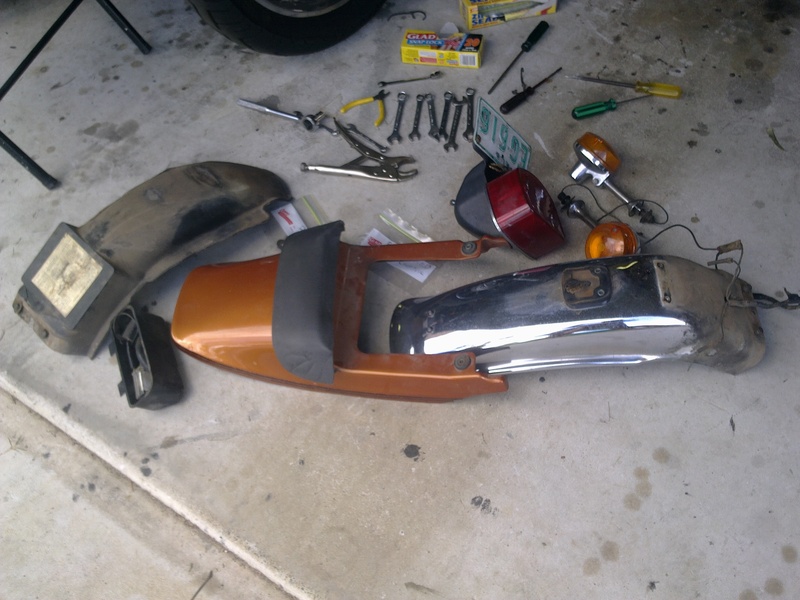 However this bike was going to be a quick 2-3 week turn around so stripping it completely was the best way to go. So the first thing we did was to strip off all the bodywork which was in reasonable condition but one of the side covers was a replacement item so it was going to need repainting. There was foam glued to the duck tail and crappy pin striping that was coming off. Next we took of the guards, the front one is important to get off so you don’t drop anything on it and damage it. 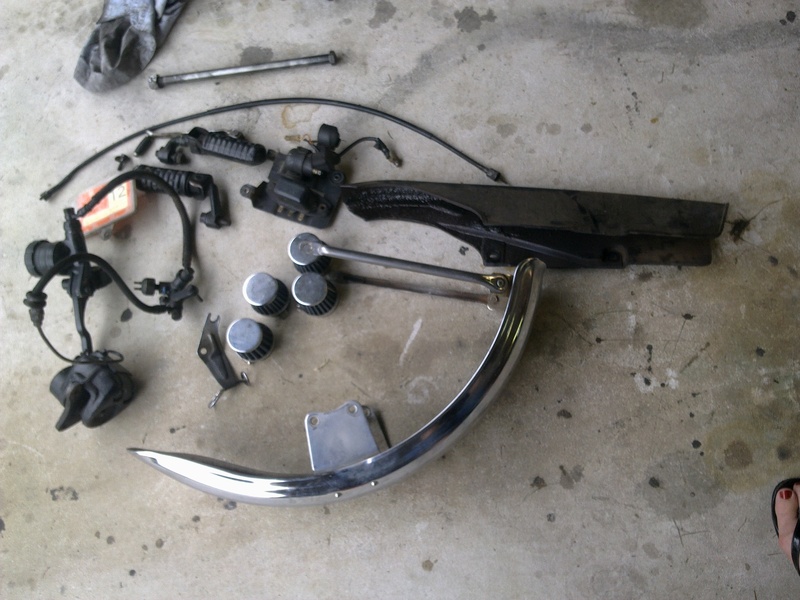 With the rear guard comes the inner guard, rear blinkers and some of the bits under the seat. 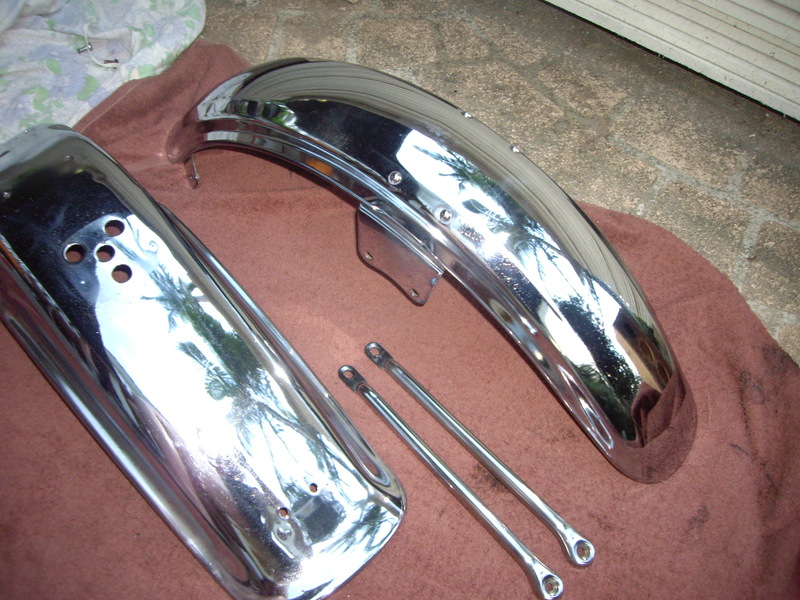 We keep stripping external body parts like blinkers, seat, mirrors, switchgear etc. 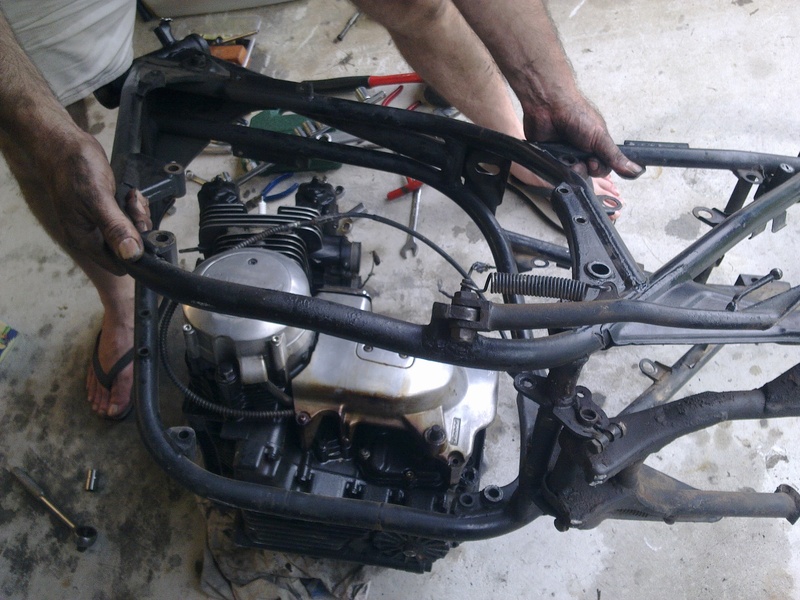 We want to get to a point where we can remove the wiring harness. Still largely complete, we will try to keep as much of the parts together as “Major” assemblies for the time being. My partner Heather bags up the bits and writes on the bags where they came from, and takes the photos of the assemblies as they come off. Still more bits come off, foot pegs, chain guard, PODS from carbs, a few under seat items and the tacho cable and front brake assembly as a unit. Rear end is taken apart, wheel out and chain out, swingarm removed then shocks. 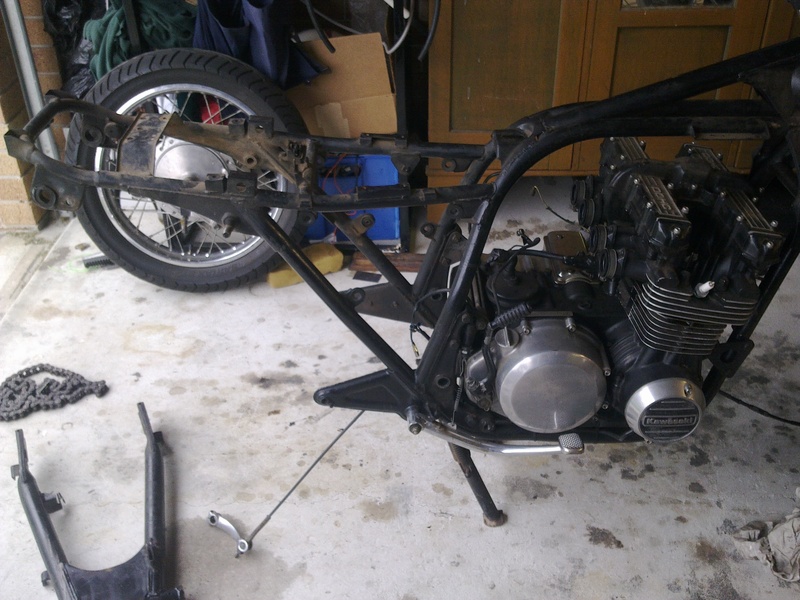 The bike is now ready to be lowered onto rear. 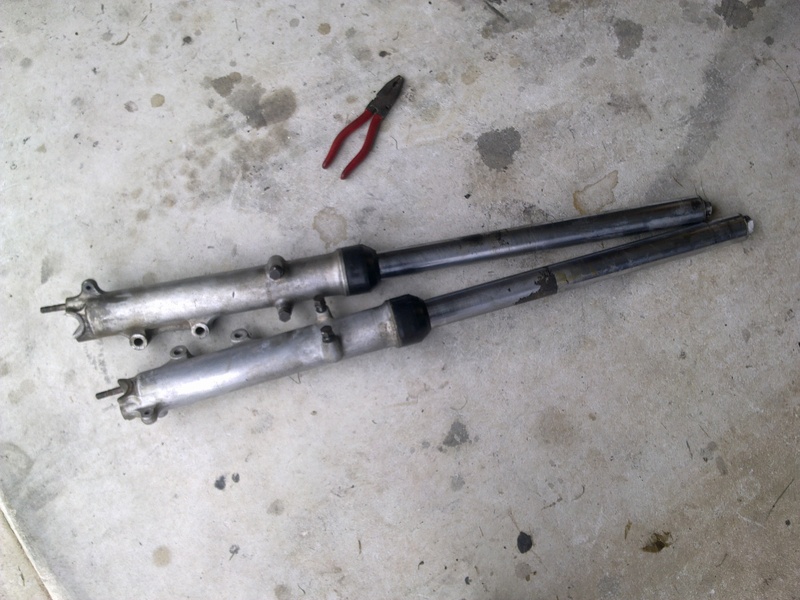 Next comes the front forks, they are very rusty around the triple clamp but the seal sliding portion is good to go. The studs at the base are shot and will need replacing. The triple clamp has grease and tapered bearings already fitted! 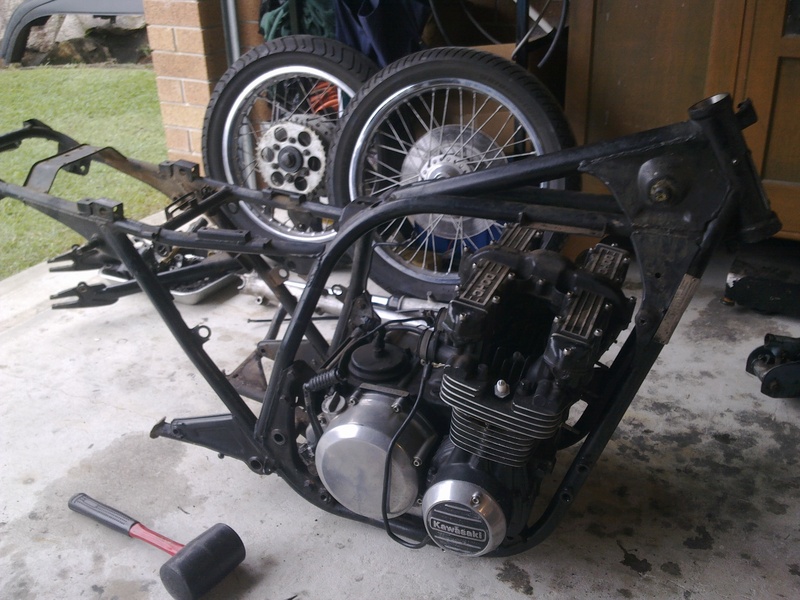 Very little to go now, basically engine in frame. 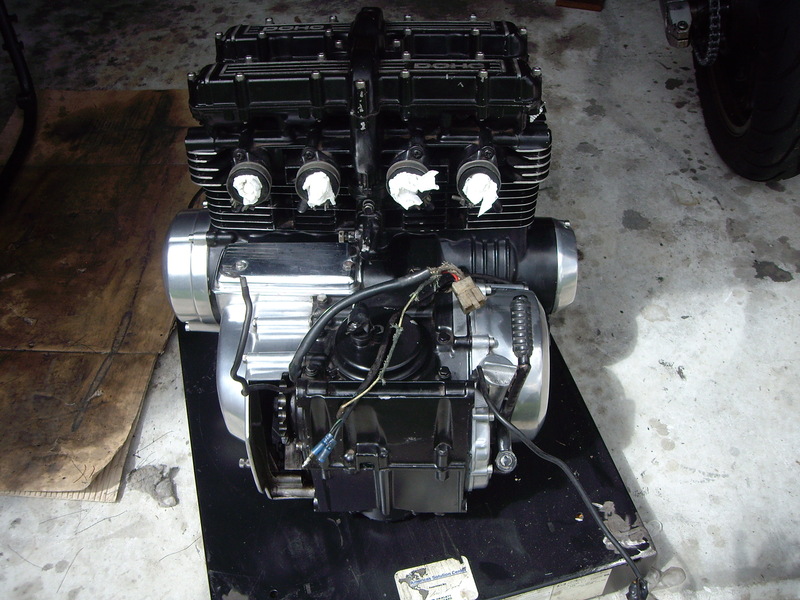 If you are working on your own, here is the easy way to remove the engine… tip it on its side onto pieces of wood covered over with thick rags. The engine is put onto a trolley so we can move it around and its given a very good clean, we wont be stripping the engine for now, basically just powder coating the frame and all the loose metal parts, then cleaning and polishing everything back and reassembling it. 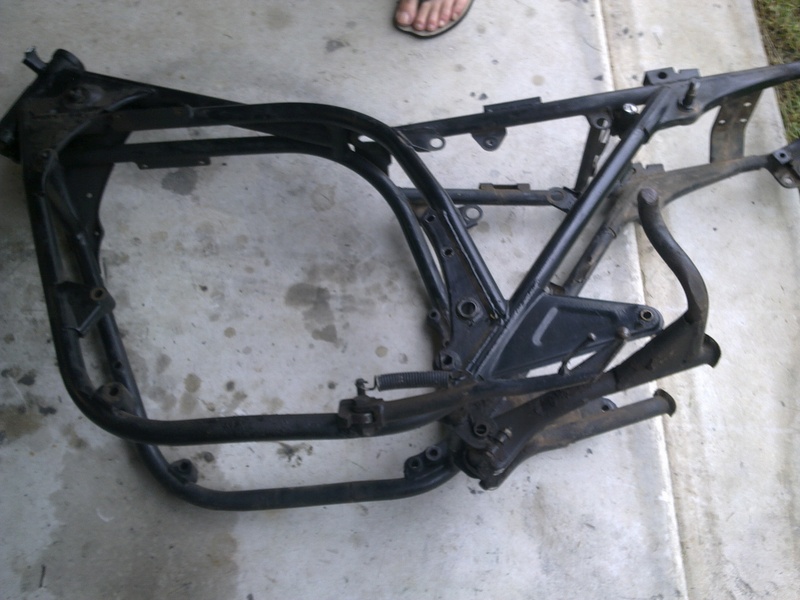 We only need to strip off the centre stand and side stand before we send the frame off to get Powder Coated. 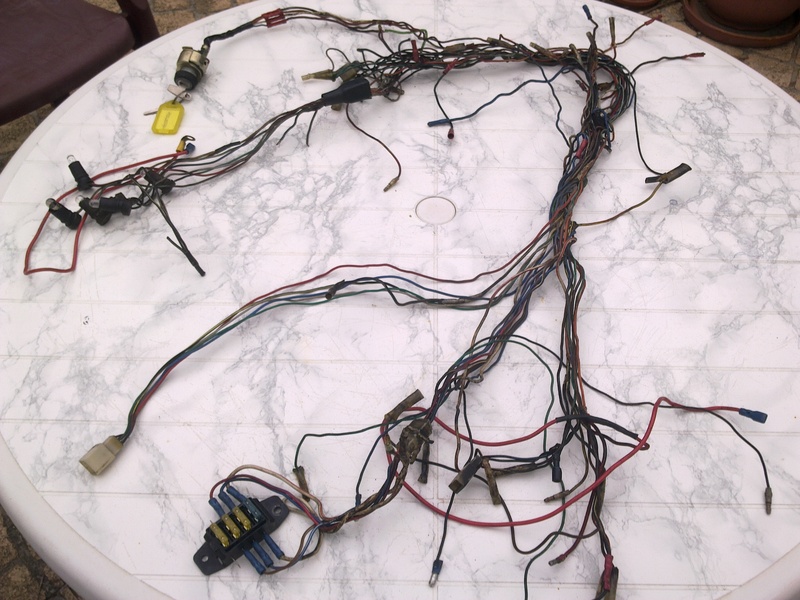 The wiring harness is a mess… all the connectors are gone and its been butchered so I will have to rebuilt it first. 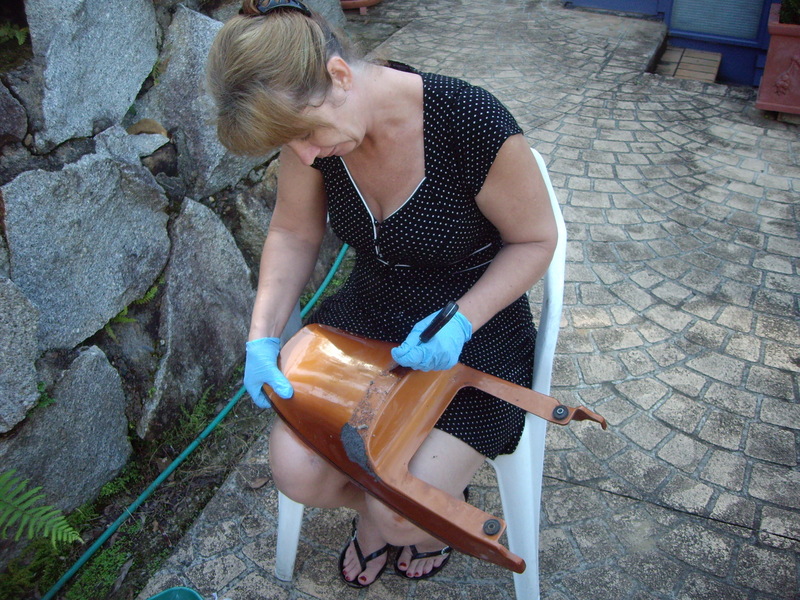 Heather gets cracking on the duck tail, there was some kind of stuck on foam that needs to go, eventually we will need to replace the paint but it should come up OK. The finished product – a job well done! 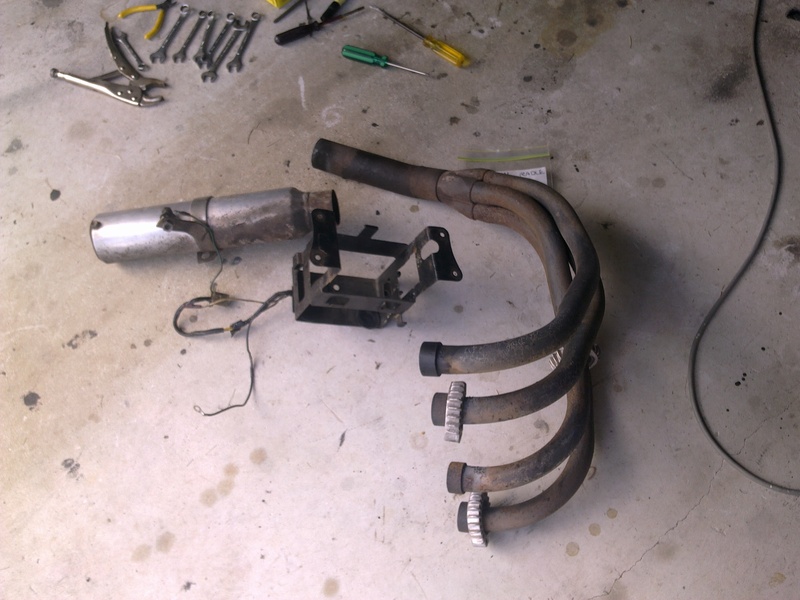 Part 2 – kz650B1 Reassembly is here.